Section 179 of the IRS tax code will allow businesses to deduct the full purchase price of qualifying equipment and/or software purchased or financed during the tax year. If you buy (or lease) a piece of qualifying equipment, you can deduct the full purchase price from your gross income. What are the limits for Section 179? The deduction limit is $1,000,000 and the spending cap is $2,500,000 before the deduction begins to be reduced on a dollar for dollar basis. All businesses that purchase, finance, and/or lease less than $2,500,000 in new or used business equipment during the tax year 2018 should qualify for the Section 179 Deduction. 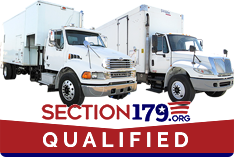 Does only new equipment qualify for Section 179? No, both new and used equipment qualify for the Section 179 Deduction as long as the used equipment is “new to you”. How long is the deduction good for? This limit is only good for 2018, and the equipment must be financed/purchased and put into service on December 31st by the end of the day. Disclaimer: Information described herein has been gathered from various sources and accuracy is not guaranteed. ShredSupply does not assume responsibility or liability for any incorrect information. Please consult with a qualified professional concerning your specific situation. Through our newsletter, you’ll receive updates on new products, services, and industry news. You’ll also be the first to receive deals on shredding trucks, service, and parts.